SLAM (Simultaneous Localization and Mapping) is a new system under development by the folks at CSAIL (Computer Science and Artificial Intelligence Laboratory, at MIT). The idea is to allow robots to navigate through varied environments without input from humans; SLAM lets the robots build and continuously update a three-dimensional map of their surroundings. Amazing video shows robot mapping its environment supported by Google's cloud services. PR2 robot shows the future of robotic helpers in this laundry-folding video. Earlier experiment in which a robot roams an office alone. But MIT's CSAIL researchers are not just doing this for robots; they hope that blind humans may one day be able to make use of a similar system to explore more confidently. To explore unknown environments, robots need to be able to map them as they move around — estimating the distance between themselves and nearby walls, for example — and to plan a route around any obstacles, says Maurice Fallon, a research scientist at CSAIL who is developing these systems alongside John J. Leonard, professor of mechanical and ocean engineering, and graduate student Hordur Johannsson. The new approach, based on a technique called Simultaneous Localization and Mapping (SLAM), will allow robots to constantly update a map as they learn new information over time, he says. The team has previously tested the approach on robots equipped with expensive laser-scanners, but in a paper to be presented this May at the International Conference on Robotics and Automation in St. Paul, Minn., they have now shown how a robot can locate itself in such a map with just a low-cost Kinect-like camera. 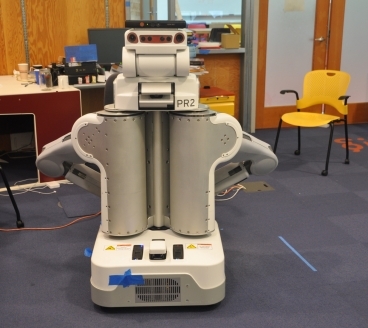 As the robot travels through an unexplored area, the Kinect sensor’s visible-light video camera and infrared depth sensor scan the surroundings, building up a 3-D model of the walls of the room and the objects within it. Then, when the robot passes through the same area again, the system compares the features of the new image it has created — including details such as the edges of walls, for example — with all the previous images it has taken until it finds a match. At the same time, the system constantly estimates the robot’s motion, using on-board sensors that measure the distance its wheels have rotated. By combining the visual information with this motion data, it can determine where within the building the robot is positioned. Combining the two sources of information allows the system to eliminate errors that might creep in if it relied on the robot’s on-board sensors alone, Fallon says. Once the system is certain of its location, any new features that have appeared since the previous picture was taken can be incorporated into the map by combining the old and new images of the scene, Fallon says.